Cesare Safieh, a popular stylist, says that “A hairstyle can make or break your look”. Long and thick hair has always been easy for style and fashion. However, it usually takes a long time to grow. Plus many required care and maintenance, this process is really a challenge for girls. To solve these problems, clips-in hair extensions must be the best option. It can help you get the length, texture and color of hair that you have always dreamed of. And the best part is that you can realize these almost instantly. If you are planning to get hair extensions for yourself as well, why not try Vpfashion. With mainly 6 reasons, our clips-in human hair extensions will never let you regret. 1. The greatest advantage of our hair extensions is that it gives you your dream hair length instantly. You do not need to wait for a long time to get the long hair over shoulder any more. 2. Hair extensions can also add extra thickness and volume to your real hair. They work excellently for thin hair girls. However, choosing the right length and weight is very important to keep the natural wearing effect. If you are not sure, please contact our professional customer service (service@vpfashion.com). They will be very glad to help you. 3. Trying different color match, without worrying about any chemical damage to your real hair is another big advantage of hair extensions. You can even put on different accessories to create a style trend of your own. 4. Hair extensions give you the flexibility to try new hairstyles without getting fixed to one. In case you get bore with the long hairstyle, remove the extensions and get a new look. Made of 100% human hair, our hair extensions are also possible to style. Wave or straight hair which is your favorite? 5. Hair extensions with clips are much more convenient to wear. They do not ask for any tools. And you can wear and remove them by yourself within a short time. 6. Hair extensions can be easily taken care of and maintained. Basically, it can be washed and treated in the same way as your real hair. However, rinse under cold water with gentle shampoo and appropriate conditioner will keep it better. Scarlet is the most viable color, even black hair can handle it very well. So if you are a dark hair girl loving red ombre hair, why not trying this. Auburn hair is also a smart choice. It will make you look elegant and charming. Burgundy hair color in fashion world is increasingly popular. Nowadays, it has become the favorite color to many Fashion stylists. To show your active personality peach red or pastel pink will be your favorite. Bright red is a nice color to show your passion. With it you will become the focus of the street. If you have beautiful blond hair, but also a fan to red, Vpfashion also provides hair extensions what you want. This red ombre extension will become your greatest choice. Want to make a nice appearance like a cute doll. Dyeing 613A of Vpfashion can help you. Plus little pink, you will become a princess from the fairy tale. Even if you have already own wonderful red hair, why not choosing Vpfashion hair extension to make small changes. Decorating with some light colors the fancy effect cannot be forgotten any more. Have you fall in love with these wonderful colors? Do you want to have a try to own your unique red ombre hair color? With 613A of Vpfashion all your dreams can come true. You can DIY it yourself. And we also provide customize color services. 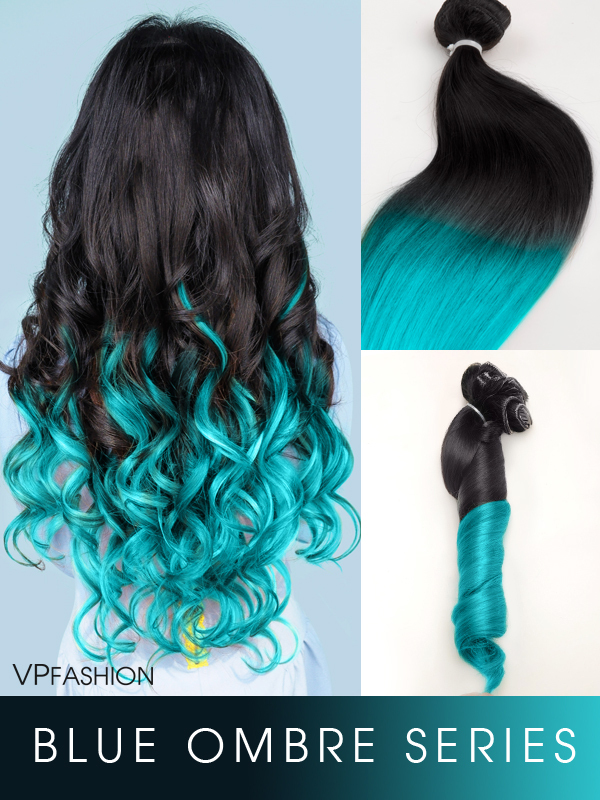 Thus no matter what color your basic hair is and what color your want have, there must one in Vpfashion can satisfied you. Black hair on top and pastel pink, blue, purple or silver at bottom is always a kind of attractive ombre style to girls. It is a wonderful style for girls who have dark hair. The pastel hair colors cover pink, purple, blue, green and even some uncommon colors. The looks are very fresh and bright. And it’s a trend in colored hair 2015. Many of our girls choose the style for their holiday party looks. I collect some looks for you to refer to. Hopefully you can find one right for your look. Purple ombre is an elegant hair look. Vpfashion customizes a set of three-tone ombre extension: black on top, pink in middle, and purple at bottom. A girl tries the style and then adds some nice curls. It looks elegant and chic. Personally, I love the look. Use ‘instagram’ for $10 OFF. She has dark roots, and wants to add bright color to her hair at bottom. Her favorite bright color for this-time look is purple shades. After knowing her requirements, we do the color customization. Katyykatt add some elegant curls to the look. It looks very elegant and nice. Black root, and purple shade bottom is always hot. Blue ombre hair always gain a lot of likes and loves from pretty girls. For those who don’t want a bold blue, can try these ombre blues, which are half natural dark hair and half are shades of blue. Use ‘LaryLabyrinth’ for $8 OFF. Do you love pastel pink dip dye style? The photo above tells us how it exactly looks. Walking on the street with the style, she successfully draws attention from the crowd. The type features brown layers as color transition, between black roots and pastel pink. Vpfashion is able to do the customization for you girls. Is’t a cool hair look? The style has black on top, silver in middle, and light blue or light lavender at bottom. Rachegeorgina wears white markup, and deep red lipstick, making a cool look. By the way, she orders a 24inches 260g 613a white blonde clip-in and diy it at home to achieve the look. So if you are a diy lover, you can also do the same thing. Our white blonde 613a extension has the function to be dyed into any colorful color. Go to the page, and see the bottom part, where there are many kinds of colorful hair looks made with vpblog 613a white blond extensions. Use ‘rachelgeorgina01’ for $10 OFF. What about adding some red hues to your hair for Christmas looks? The style is specially made by vpfashion hairstylist for welcoming New Year. The red is very bright and elegant. Want to have the shade, or have your own ideas on your favorite color? Tell us through emails, and we’ll do color customization for you. Is’t a bright hair look? Our 613a white blonde extension is dyed into red shades- a bright hair color, and match well with her black roots. The style is 20inches 160g dyed 613a. The hot pink ombre is just beautiful! Use ‘Durfgirl254’ for $8 OFF. For a low cost while perfect result, simply use clip-in hair extensions to achieve the popular look. Wigs can create this look as well. However, a set of human hair wigs are expensive and synthetic ones look fake. As a result, more and more girls choose colored hair extensions for occasional uses. Since all of the extensions in blog.vpfashion.com are made of 100% remy hair, you can also re-dye it to get your favorite colors. If you are a talented dyed girl, choose blonde 613A# extensions to dye color yourself. Or choose vpfashion color customization to get your favorite hair color. Hey sweeties, hope you all have a happy new year. Colors make our life colorful. At the end of 2014, we launched colorful clip in human extensions on our site and we’re so happy that you guys love them. Let’s see in the previous days what other girls chose from our colorful hair. <3<3 If you are also fan of bright colors and wanna have a similar style, simply click the pic to see details. Don’t worry if you didn’t find your favorite color. With the help of blog.vefashion.com you can custom make your own extensions color.